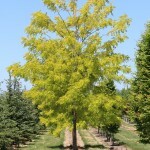 An oval, upright arching tree best known for its bright lemon-yellow summer color. In some shade, the color tends toward chartreuse. 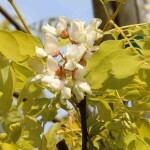 The late spring pea-like flowers are white and held in pendulous clusters. 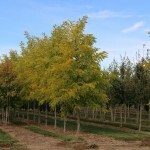 The foliage is pinnately compound, giving this fast growing tree a fine texture. The bark develops deep furrows with age. It grows well in urban conditions, and adapts well to heat and poor, dry soils.